Please spend a few minutes sending a message to the European Parliament. 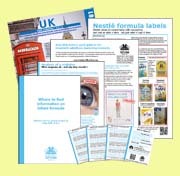 Baby Milk Action's briefing paper explains how the European Union is on the verge of authorising a claim that follow-on formulas and baby foods improve babies' eyesight, despite the fact that independent reviews of the science have found 'no proven benefit' of the ingredient at the base of the claim. The European Parliament's Environment Committee voted on 16 March to block the claim and now it goes to the full Parliament in April. Your messages to MEPs were very important when it came to the Environment Committee vote. Please contact your MEPs now for the full vote. The claim had been approved by the European Food Safety Authority based on 'proprietary information' which is confidential for commercial reasons and the discussions so far have all been behind closed doors. This first time since the European Health and Nutrition Claims regulations came into effect in 2006 that Members of the European Parliament (MEPs) are campaigning to block a claim. Baby Milk Action is also calling for a moratorium on the whole process governing legislation on baby foods, which is undemocratic and untransparent. I am contacting you as you are my representative in the European Parliament. I would like to draw your attention to a claim that the European Commission may authorise for use on baby foods relating to an ingredient called DHA. The claim contradicts the findings of independent reviews of the science, which have found 'no proven benefit' from adding the ingredient to infant formula. The European Food Safety Authority, in its assessment, states that there is no evidence to support the claim for follow-on formula or baby foods. Despite this, the claim will be approved unless Members of the European Parliament intervene. I ask that you vote in Parliament and any relevant committees to which you belong to block the health claim approval. I also ask that you vote for a moratorium on all claims for infants and young children until the process controlling legislation is made more transparent and accountable. Leading health bodies agree that health and nutrition claims ARE NOT appropriate for foods for infants and young children. If an ingredient is proven to be safe and important for health, it should be added and listed as an essential ingredient for ALL formulas in the EU Regulations. No baby should be fed an inferior formula. Ingredients should be listed on labels, but not promoted with claims. The aim of the Health and Nutrition Claims Regulations is to help the public make healthier choices, not to mislead. Parents who choose to bottle feed want to do the best for their children and need truly independent, objective and evidenced-based information. The DHA claim not only misleads parents and undermines breastfeeding. It can also divert attention from risks. The US Food and Drug Administration has recorded nearly 100 cases of babies having an adverse reaction to formulas with the ingredient at the centre of this claim. And recently published research suggests there may be a link between consumption of DHA when young and obesity and other risk factors in later life such as higher blood pressure. DHA is also included in the 'protect' logo that Nestlé has added to labels of its formula around the world. Nestlé has admitted in response to our email Nestlé campaign that there is 'no proven benefit' from adding LCPUFAs to formula, but refuses to remove the logos. Nestlé's absurd argument is that in the detail of its claim it refers to the benefits of DHA in breastmilk, not formula. If people assume that adding DHA synthesised from algae or fish eye sockets to formula will have the same effect as as the DHA in breastmilk - a totally different environment - then Nestlé seems to suggest that is their fault! Full details and references are given in the briefing.